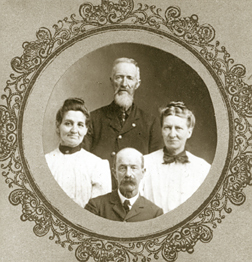 In 1975, when I was a young teenager, and filled with curiosity, I was given a small old photograph of my great-great-grandfather, Andrew Jackson Miner, and his brother Ephraim Miner, and their wives. The photo portrays the couples in a studio setting, in their later years. As Andrew would have died in 1921, I estimated the picture to be at least 53 years old; probably much more. Andrew is shown to be bald and has a floppy, walrus-like mustache, while his brother Ephraim has a head of white hair in addition to a white mustache and beard. The looks on all four of their faces appear to be stern. Many were the afternoon when I came home from school and studied the people in that picture -- their faces, posture, clothing -- wishing I could have known them and asked questions about their lives in the 1800s. I daydreamed about their voices and what they would have been talking about as the shutter was being snapped. I asked several great-aunts and uncles about the people in the photo, but they all had been very young when the subjects had died, and didn’t remember very much about them. Though I had been interested in history since I was old enough to have stories about George Washington and Abraham Lincoln read to me, gazing at the pictures created in my imagination an insatiable curiosity about the past. 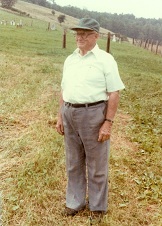 I learned that my ancestor Andrew had lived in the town of Washington, PA, while his brother Ephraim had lived 55 miles away, as the crow flies, in a farming village called Kingwood in rural Somerset County, PA. During the summer of 1978, when I was 17, I took advantage of an opportunity to satisfy my curiosity. My brothers were at a summer camp not far from Kingwood, and on a Sunday drive to pick them up, I persuaded my parents to take us on to Kingwood, to see what the countryside looked like, and perhaps to find out about some long-lost Miner relatives. My father agreed to my request, and after carefully checking a map, was able to steer us into the very small town. Dad stopped the car at an old stone house to ask for further guidance. An older gentleman, Forrest Hall, came to the door and asked who we wanted to find. 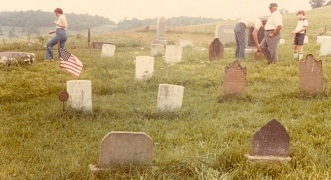 My mother (left), brother Eric (right) and Mr. Hall explore the old Younkin Cemetery at Paddytown, where Ephraim's first wife and sons (foreground) rest for eternity. Upon hearing our names, he proceeded to tell us that there most certainly were Miner relatives living nearby and that a long time ago he had known Ephraim Miner, the man who was in my photo. Mr. Hall said that as a boy he had to shout loudly at Ephraim when talking because the elder man’s eardrums had been deafened by the roar of cannons during a Civil War battle. Mr. Hall then made us a once-in-a-lifetime offer. He said he would ride in our car and take us to the old cemeteries where Ephraim and his wives and adult children are buried. The first stop was the Younkin Cemetery in Paddytown. There, Ephraim's first wife Joanna and their sons Lincoln and Grant are buried. We noted the fading letters on Joanna's grave, dated 1875, and that the name was spelled -- "Minard" -- and saw the roughly lettered, handmade markers for the two sons. 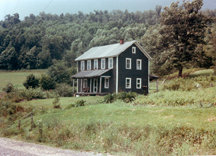 With a great surprise, Mr. Hall made the best and final offer of the day, revealing that Ephraim’s daughter was still living, at age 86, in her father’s farmhouse in a nearby hollow. He suggested that he ride with us to her place so that we might meet her. I could scarcely believe that an actual flesh and blood relative -- and a Civil War veteran’s daughter at that -- was still living in 1978, and I became nearly giddy with excitement. We accepted the offer to drive onto her home. The route turned off the pavement down a steep, narrow dirt road, and led to a clearing with a barn on one side and the road and a two-story, green weather-boarded house on the other, where we parked. Our guide led us to her side porch, and after calling into her through an open screen door, introduced us to a very tiny, delicate elderly lady named Minnie Gary. 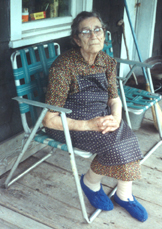 She was nearly blind but had been cooling jelly on her wood stove, despite it being a stifling hot August day. My father, with typical forethought, had his camera in hand and began taking photographs. I grasped Minnie’s hand and told her that her father’s brother had been my great-great-grandfather. Without hesitation, she invited us inside, and we spent the next half-hour sitting in her kitchen, hearing many stories about her father and his Civil War experiences, and of his brothers and sisters, all of them long dead. Although she physically could not see, her mind was alive with sights and sounds of people she had known over her 86 years, including her father, who had been born in 1839. I showed Minnie my old photograph, which I had brought along. Although she couldn’t make out the details, she smiled knowingly. She told us a story about one day when she was a young girl and was working outside in the garden, next to a small hillside. All of a sudden, pebbles and small rocks began to roll down the hill in her direction. Puzzled, she glanced around but saw nothing, and went back to work. Soon after, pebbles and rocks again came tumbling down the hillside toward her, and she took a second, more thorough look. She then heard some chuckles, and saw her “Uncle Andy,” my ancestor, peeking over the crest of the hill, enjoying his practical joke at her expense. Andrew and his wife had traveled from Washington to Kingwood for a visit, and ended up staying with Ephraim and his wife and family for several days. At one point the two couples were having such an enjoyable time that they decided to go into town to have their photograph taken. All along the way they laughed and joked and had wonderful fun. In fact, Minnie said, the women had a lot of difficulty getting their men to keep a straight face for the camera. And here I thought they looked stern. It was at that precise moment that I first heard the voices of history come alive. Little did I know where the echoes of those voices would lead me someday.